Seattle Urban Sketchers in the South Lake Union area. It was cool and damp, but the rain had stopped by the time the sketchers assembled. St Spiridon is an old (old in Seattle means the mid-1800s) Russian Orthodox church which is now surrounded by modern condos and hip cafes. 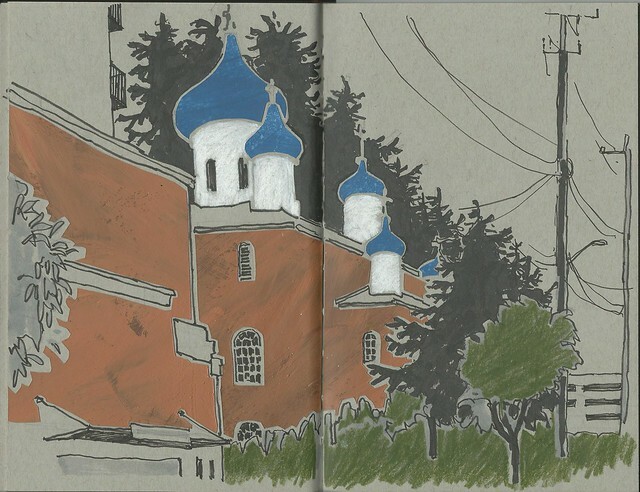 Those onion domes were irresistible, but quite a challenge to draw and I did a lot more of a pencil underdrawing than I usually do. The ink and colored pencil were done on site, but I finished with some collage papers when I got home. edit - After checking my dates, the congregation of St Spiridon dates from the 1800s, but the church from the mid-1900s. Well done! Your collage is so seamless and neatly cut that it looks like pastel. I think it's the marble dust, not my precision cutting. I've been painting sheets of sketch paper with acrylic to make collage paper. I wanted flat, matte color and the paint geeks at the DS mothership suggested marble dust. Bold and decisive composition. I like the angle you chose and inclusion of simplified surrounding details.